With over a decade of experience coordinating Internet marketing campaigns of all types, Global Client Services has the knowledge and expertise to manage every facet of your online promotions. Our full suite of marketing services include planning, customizing and executing email campaigns, creating and implementing market research surveys, event registration services and database management to ensure you gets results. We have assembled a winning team of Internet marketing specialists that have the vision to see the complete marketing picture for your business and how each marketing function interrelates with the others. Instead of dealing with multiple vendors to fully accomplish your sales and marketing strategies, GCS' one-stop integrating marketing strategy approach will alleviate cost and save your valuable time. Each client at Global Client Services has their own project manager that prioritizes marketing tasks to be completed based on that clients individual needs and budgetary considerations. 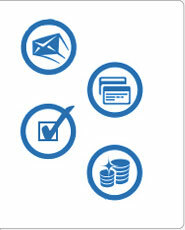 Global Client Services manages every facet of your company's email marketing campaigns. With over 10 years of successful email marketing experience, GCS understands what it takes to generate results. From planning and developing customized email pieces to delivery and tracking, our team of email marketing specialists handle every detail. The feedback we gather from your target market in both blind and branded surveys about price points, new products, your website or customer service is invaluable for adjusting your online and off line marketing campaigns. Global Client Service's online market research team are experts at planning branded and blind surveys and using the information collected to better meet your clients needs. If your company is planning a trade show, seminar or convention GCS' fully customizable event management software will simplify the process. Virtually every aspect of your communication with attendees can be managed online including invitational emails, branded registration, payment, reminders and post event follow-up. Our event registration and management services allow you to focus on what you do best while we handle all the details to make your event a success. Organizing and managing the data you receive from your prospects, clients, email campaigns and surveys builds the foundation for future marketing endeavors. Our engineers will design database solutions that sort and manage your data in a secure environment while creating new time saving efficiencies. We look forward to being your one-stop source for Internet marketing and partnering with you to market your business online. Thanks for considering Global Client Services.